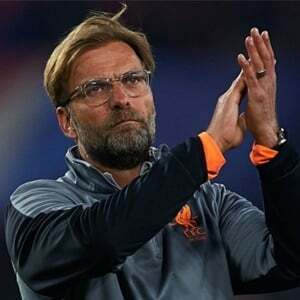 Liverpool - Liverpool manager Jurgen Klopp said he would take the positives from his side's 1-1 draw with Chelsea despite the disappointment of conceding a freak 85th-minute equaliser. Mohamed Salah's goal against his former club looked set to restore Liverpool to winning ways after their calamitous 3-3 draw against Sevilla, only for Willian's mishit cross to earn Chelsea a point. Liverpool remain fifth and will fall 14 points off the pace in the Premier League if Manchester City win at Huddersfield Town on Sunday, but Klopp said he had been encouraged by his team's display. "In our situation, if we would really think about Manchester City we would be crazy," said Klopp, whose side had let a 3-0 lead slip against Sevilla in mid-week. "How can we get Manchester City? We have to win games, but if they go on winning all their games, we can do whatever we want. "I'm happy about big parts of the performance. I'm really proud of the attitude. Everything was good until Willian crossed the ball. "The world is in a strange, crazy place at the moment and there are much more important, crazy things that are happening. I can easily live with a point against Chelsea." Willian struck two minutes after coming on for Davide Zappacosta, drifting across the box from left to right before lifting a cross towards the back post that dropped beneath the crossbar. Klopp had been trying to send on the fit-again Adam Lallana in order to change to a back three and said he was mystified by referee Michael Oliver's initial refusal to allow the change to take place. "In my mind, Ragnar Klavan would have been in exactly the position where Willian crossed the ball," Klopp said. "That means we would have blocked the cross. So you don't feel too good when the ref doesn't allow you to change the system because he thinks maybe it's time play (wasting) or something. "I've no idea why he said no." Klopp said Chelsea had played more defensively than he had expected and summarised their approach as: "Deep defending and giving the ball to Eden Hazard." But Chelsea manager Antonio Conte felt his team had "dominated" the second half and said Liverpool's goal -- tucked away by Salah following a loose touch by Tiemoue Bakayoko -- had also been fortunate. Asked if Willian's lob had been deliberate, Conte smiled and said: "It's not important. It was important to score. "But at the same time I think that we conceded the first goal in an unlucky way. "It was a fair result, but in the end I think that we deserved a little more than Liverpool." The result kept Chelsea in third place, but they now trail second-place Manchester United by three points and will fall 11 points behind City if Pep Guardiola's side prevail at Huddersfield. Although his influence faded, Hazard was Chelsea's stand-out performer, his every touch in the first half oozing sophistication. Having missed the start of the season after ankle surgery, Hazard has returned to top form in recent weeks, whether playing as a wide forward or -- as at Anfield -- supporting Alvaro Morata in a 3-5-2 system. "The start of this season was full of trouble with Eden because he had an injury with the national team and then we started the season without him," Conte said. "When you have this type of injuries and you need surgery, it's very important to have the best time for your recovery. "Now Eden is in really good form. He likes to play as a striker. There is a good link with Alvaro. "For me it's also a great opportunity to have the possibility to play with two different systems. "Against Qarabag (who Chelsea beat 4-0 in the Champions League) we played with a 3-4-2-1, today we started with a 3-5-2. It's very important that we don't lose our identity in both cases."